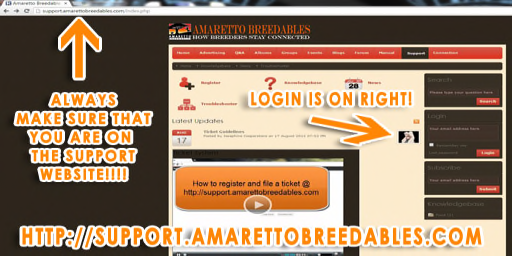 Howdy Amaretto community! I hope that your week is going good so far! Stay strong… the weekend will be here before we know it! *Always include your full SL name, include resident if you do not have a last name! *Include any transaction in reference to a purchase, including… not delivered items or even duplicated breedables that you recently purchased! *Always be respectful to the Amaretto Staff they will help you in any way they can. *Be sure to include enough information such as UUID’s, Parents information if having a bundle issue, or names of a missing horse. *Tickets can take up to 72 hours so please don’t bother the csr’s if your breedable is not immediately returned. * Please understand if you are not showing as owner of a breedable on our servers we can not return it to you. (That means no tickets for friends, family, or partners) You wouldn’t want us to send your horse to someone else! *If the CSR ask you for a slurl, make sure they are on your allowed list and paste the slurl to the breedable your having a issue. *Don’t file several tickets for the same issue you can include multiple issues on one ticket, the more we have the longer it takes to get to them all. *Do send all breedables in world in a folder with your name and ticket number (Example: Jaymee Caproni AQM-222-22395), as many breedables that are passed to us with no name they can easily get lost in our inventory. *Make sure that you are sending the breedable to the correct CSR. Don’t assume it will be the same one who did your last ticket. Read your responses carefully and send to the proper CSR. *Doing all of these things will ensure your ticket is answered and not left asking for more info because we can usually close a ticket if all info is included! If you have never filed a ticket please watch the video on this page it will help you get registered and on your way to ticket filing with ease! Please observe all the rules of the ticket system. If you are unable to login or need more help reporting an Amaretto issue you can message Avalon Crystal or send a note card if im not available!